Every example in every XYZ Textbook is worked by multiple student instructors in a truly unparalleled library of more than 10,000 math video tutorials ranging from basic mathematics to calculus. MathTV.com is an incredible resource for instructors and students. Every example in every XYZ Textbook is worked on video by multiple student instructors. Students benefit from seeing multiple approaches, and gain confidence in learning from their peers. The MathTV library contains over 10,000 videos, from basic math through calculus. It's great for learning the material at hand, and for remediation too. With MathTV, students have access to math instruction 24 hours a day, seven days a week. Assistance with any problem or subject is never more than a few clicks away. Every example in every XYZ Textbook is matched with a set of 2-4 tutorial videos. Instruction by a peer tutor can help students gain confidence in doing math. Each video is done by a different instructor so that students can see slightly different approaches and strategies to solving each problem. Almost every set of videos has one conducted in Spanish, by a native speaker. Video instruction is asynchronous, and allows students to repeat, rewind, and review. It's right in your XYZ eBook! 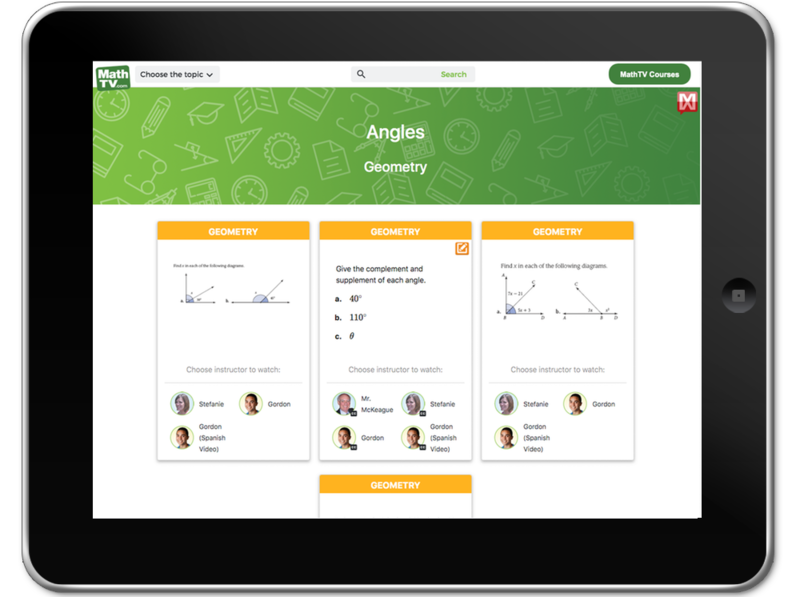 Watch MathTV video lessons in context alongside every example in XYZ eBooks. The tutorial videos are in the right hand column of the eBook, in the "Tools" menu. All the videos are accessible via any mobile device or tablet. Watch videos on the go—you can access them anytime, anywhere! Scan the QR codes located inside printed XYZ Textbooks* with your mobile device, and it will take you directly to the accompanying MathTV video. *QR codes are not available in every textbook.